Now you can be wearing this Protected By A Policeman T-Shirt. This t-shirt is available in a bunch of women’s styles so that you can get the perfect shirt for you and you can get his t-shirt in sizes Small – 3XL and it is available in many colors too. On the shirt you can see a worn looking sign that says “Warning this girl is protected by a policeman”. 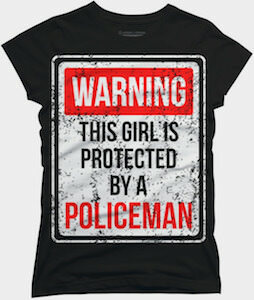 And we all are protected by the police so everyone can be wearing this t-shirt but if your boyfriend or husband is a policeman then this t-shirt is even more perfect for you. If your humor is not always appreciated then you should check out this special t-shirt. 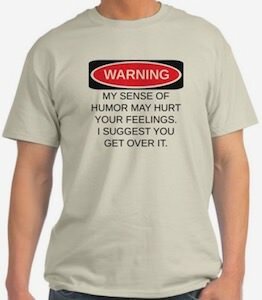 On the t-shirt, it shows a warning sign on top and below it the text “Warning My Sense Of Humor May Hurt Your Feelings. I Suggest You Get Over It.”. You can get this funny t-shirt in styles for both men, women, and kids and it does come in many fun colors and sizes too. So warn the world about your humor so that they all can get over it before you tell them a joke they don’t like. 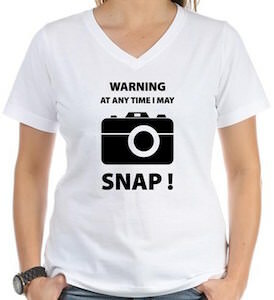 This t-shirt says “Warning At Anytime I May Snap!” and it also shows a picture of a camera. So if you like to take pictures of anyone and anything at no set time then this could be the t-shirt for you. And yes you can get this t-shirt in many fun colors and even different styles for both men and women. Of course you need to have a camera to be allowed to wear this t-shirt but hey you phone has one of those I am pretty sure about that. So if you like to take photographs with your camera then start warning the world around you by simply wearing this amazing t-shirt. 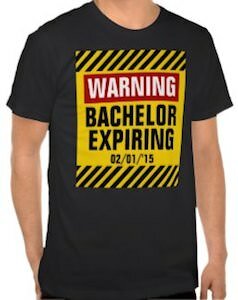 This is the t-shirt you need to have to warn your friends. As you can see on the picture this t-shirt shows a warning sign with two people and a bunch of zombies. It also says “If zombies chase us I’m tripping you” and that of course is a fair and funny warning. This zombie warning t-shirt is available in black and white in a very big range of adult sizes. 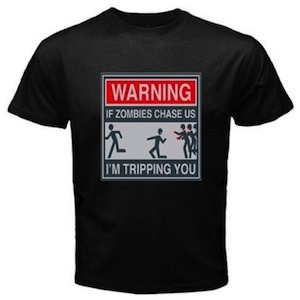 So warn you friends by wearing this Warning If Zombies Chase Us T-Shirt. Warning I Do Smart Things that is what this t-shirt says. And it does it with a big yellow warning sign that has and ! and a pair of glasses on it. This t-shirt is super for a smart geek or just for fun. And you can get this t-shirt in a male and female version in all kind of colors. 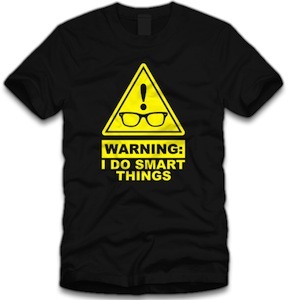 Be smart and wear this Warning I Do Smart Things T-Shirt. OK so you like baseball but hate it when people interrupt your pleasure of watching the game. Don’t worry we have a solution for that. 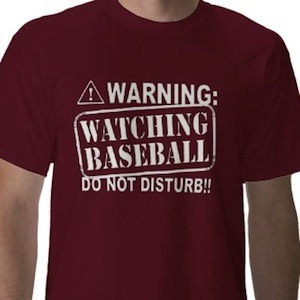 This t-shirt says “Warning Watching Baseball do not disturb! !” so if they don’t understand then you have a good reason to ignore them. And if this is not the color of you team then don’t worry it comes in a buch of cool colors. Get your own Warning Watching Baseball Do Not Disturb T-Shirt. Are you gone quit smoking? If so prepare yourself and order this t-shirt. This shirt comes in yellow, light blue and pink. It says Warning I Quit Smoking (then a no smoking sign) Speak to me at your own risk. You have to agree it’s funny and may keep you out of trouble. And it could help you in an other way to. Maybe now people stop bugging you while you don’t want to chat. 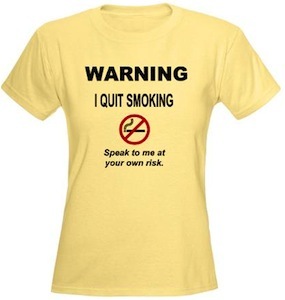 Time to prepare by ordering this Warning I Quit Smoking T-Shirt. This funny t-shirt says it all. We know those parental advisory labels on movie and video games and now there is one on this t-shirt. And this shirt comes in different styles and colors. 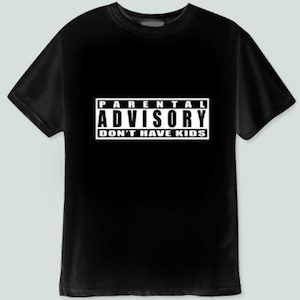 Get this funny Parental Advisory Don’t Have Kids T-Shirt. The worst thing imaginable on this planet earth….The most severe of errors……. The Blue Screen Of Death. 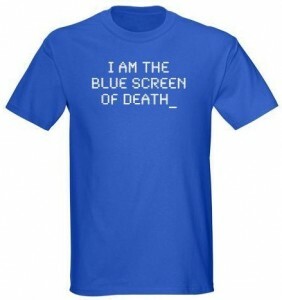 This t-shirt features “I Am The Blue Screen Of Death_” printed on the front of this blue t-shirt. This is a perfect geeky t-shirt to wear out for any occasion and may just be a hit when you wear it. You can find this Blue Screen Of Death t-shirt in sizes Small to 3XL and in colors blue and green, made from durable pre-shrunk 100% cotton. Get your Blue Screen Of Death T-Shirt.